Demand Pull and Cost Push inflation with examples - FreeEconHelp.com, Learning Economics... Solved! 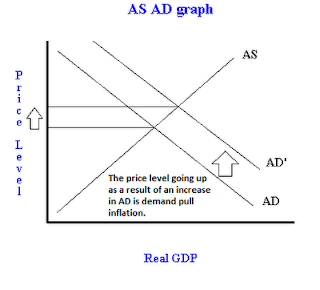 Demand-pull inflation happens when aggregate demand (AD) increases in an economy and intersects the short run aggregate supply curve (SRAS) to the right of where SRAS and long run aggregate supply (LRAS) cross. This causes some inflation to occur in the short run, and even more in the long run as the economy adjusts (and the labor market moves back to equilibrium). 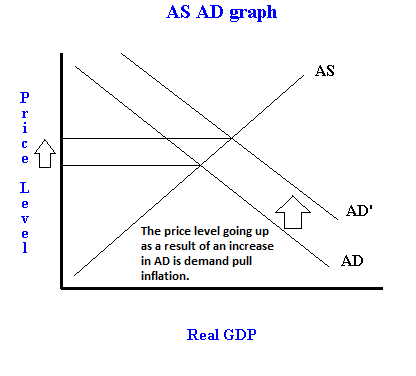 Demand-pull inflation can occur for an reason that causes AD to increase but the most common are expansionary fiscal and monetary policy, and positive expectations about the future (increased growth/income expectations). 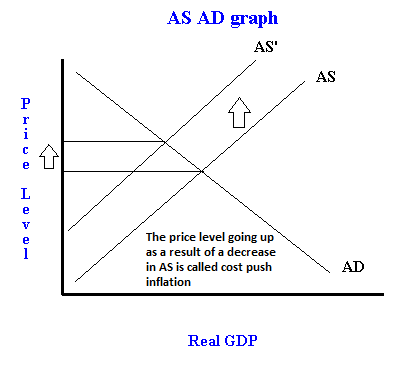 Cost-push inflation happens when SRAS shifts to the left (decreases) and intersects the AD curve to the left of where AD and LRAS cross. This will cause inflation in the short run, but prices will drop back down again in the long run as the labor market adjusts back to equilibrium (with wages dropping). Note that some classes ignore the long run, and only care about where AD and AS cross and in this case cost-push inflation is a permanent shift in the AS curve causing some amount of inflation. 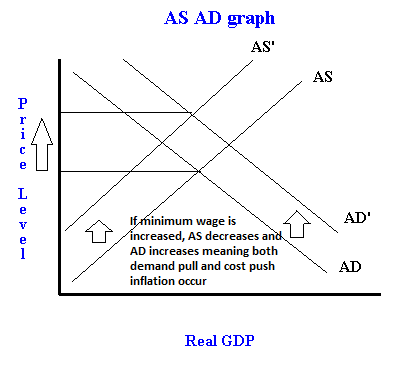 A common question considers whether inflation caused by an increase in wages (such as increasing the minimum wage) is caused by demand-pull inflation or cost-push inflation. In fact, it is caused by both. 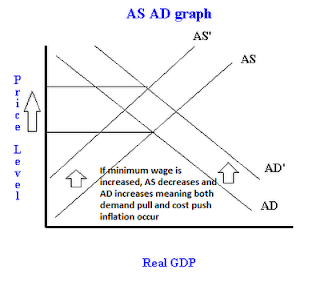 An increase in wages is an increase in the cost of inputs which shifts the AS curve to the left (a decrease). An increase in wages also translates to an increase in income which means consumers can spend more making GDP larger and shifting AD to the right (an increase). The increase in costs is equal to the increase in income to the shifts must be the same and equilibrium GDP will be the same only at a higher price level. Assume that some of the income is saved or paid in taxes so the AD shift will be smaller than the AS shift. Finally, you can assume that the multiplier effects from the increase in consumption spending (and investment from savings and government spending from taxes) is large so that the AD shift will be larger than the AS shift. The third scenario probably the most likely, but we do not know for sure unless we have some equations or data to base it on. So the real answer here is that inflation caused by an increase in wages is a double whammy of both demand-pull and cost-push inflation, we cannot blame it on one source.